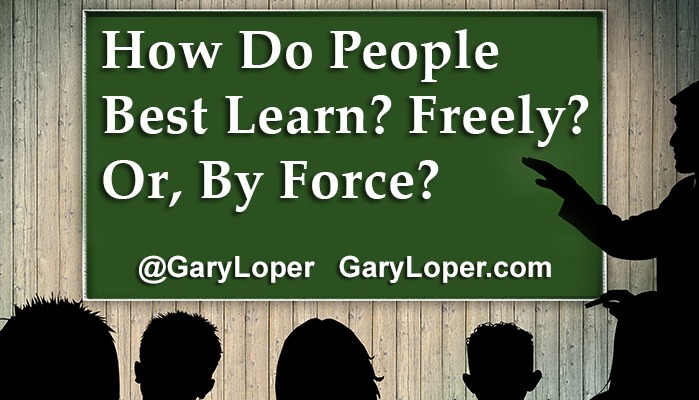 How Do People Best Learn? Freely? Or, By Force? Leaders understand we most often are motivated by direct result — getting a product or service to market, or raising a child or protégé to achieve their dreams, or just getting through life with the least harm done possible. This is particularly true of parenting. 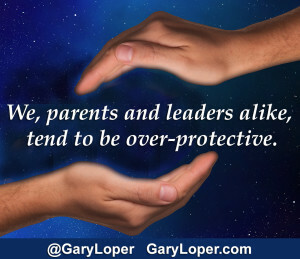 We, parents and leaders alike, tend to be over-protective, often limiting creative potential and probably damaging growth. We know firsthand many of the mistakes others will make and we rush to tell them how to do it, often in a demanding way. They would be better served in a showing, sharing way. Is our world really so busy and deadline conscious that we, as leaders, cannot be compassionate to those we work with and serve? Are we so busy that we fail to teach in the best possible light, a light that is certain to provide beneficial results for everyone? Each of us is genuinely unique, so much so, that the ways we learn and are motivated often stand in conflict with the ways throughout our life we are given “advice”. Advice that we may not be ready to receive or are unwilling to hear. Over time we need to learn for ourselves. Sometimes those lessons are painful. If we are willing to pay attention, we can gain from that past pain. If not, we will be presented with the same lesson time and time again until we ‘get it’. Looking back, I can recall leaders who never would have admitted their mistakes. Instead they would scream and belittle to beat their way into someone’s head. I have yet to see either method be very effective. Have you? How different things would have been if those same leaders had led with compassion and understanding, allowing us to make our choices. Yet, always near to assist us should things start looking a little dicey. How different things would have been if those same leaders were guiding, listening, and sharing to help us realize we have more within ourselves than we realize. How different things would have been if those same leaders actually cared, instead of berating and beating everything out of us as though they knew everything. 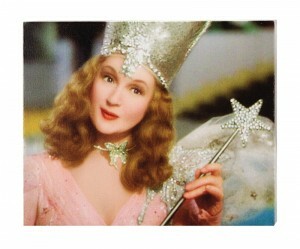 Glinda, the Good Witch of the North in the Wizard of OZ, represents the compassionate leadership we seek. As you may recall, she patiently waits ‘behind the scenes’ as Dorothy follows the Yellow Brick Road, persistently looking out for Dorothy’s welfare while allowing her to learn her own lessons. When necessary, she quietly and subtly steps in to help — awakening her, for example, from the poppy field sleep to continue the journey. Mistakes and misfortunes visit all of us. Those we serve have their own. As leaders, we must always remember everyone has a deep desire to matter, to be needed, loved and heard. Sharing our experiences in a way that respects them can do wonders in building them into all they are to become. When possible, there is nothing like personal experience to drive home a lesson that allows them to learn on their own. Along the way, we do what we can to minimize the harm done to them or the product — mindful of course that many people learn best when they fail. I can recall a story of a project manager whose mistakes led to more than $1 million in losses to the company. To the project manager’s amazement, he was not fired. Instead he was reassured the company had just invested $1 million in his education. So often we make mistakes and are thrown away — by companies, in our relationships, or by family. It seems the times we are most in need of love are viewed as those times we deserve it the least. In the example above, the boss demonstrates his compassion and we sense he somehow knows — even expects the company will more than recoup their investment in this project manager. How is it in your world, your company, or your family? 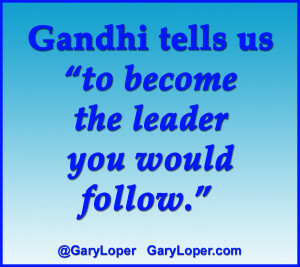 Gandhi tells us “to become the leader you would follow.” Far too often our experiences touch us deeply. We go about learning things we would never want to go through the same process to learn again. It turns out that learning what not to do invokes our own passions of what we truly want to do and become. It is my hope that the thought of people being disposable ends soon. After all, we will never think or learn alike, and each of us have personal issues that tend to blur our visions. It’s been my experience many times those who do not comply with guidelines are disregarded, perhaps blurring their visions even further. We can change this pattern through compassionate leadership. The definition of compassion is ‘to suffer with’ or ‘have sympathy’. For us, perhaps it means to discern how others feel by remembering how we may have felt under the same circumstance. Essentially, all of us are walking wounded — just keeping that in mind will provide an incredible shift for all those you serve. We would do well to also remember problems never can be fully left at home, at the office, or swept under the rug. Putting the needs of others first, and investing time and energy in those we serve will come back to us more than ten-fold. Such is the servant leader. For me, that leader was Rima. Rima helped run a small marketing company. She was incredible. Why? I believe this to be so, because she took notice of her employees’ gifts and talents, and she fed their need to share them. Over the years, I saw her turn many lives around — including my own — by listening, nurturing, guiding, allowing us to learn from our own mistakes, and validating us. Through her example, folks like me now have the great opportunity to Pay It Forward.